We launched the Writersroom 10 at the ‘Theatre-Broadcast Conversation’ last year – our bi-annual partnership programme for writers and theatres, marking the importance of theatre as the first home for many brilliant writers in the UK, and investing in writers and new theatre writing at an early stage. 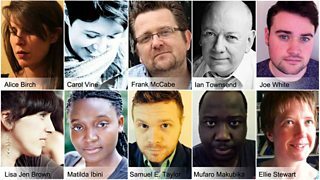 The 10 writers will be part of a year-long development scheme and will each receive a seed-commission of £1000, a BBC mentor to broaden their scriptwriting horizons and bring a fresh perspective to their work, the opportunity to develop new work for The Space and a programme of partnership events with theatres. Tim Price: “It was a real privilege to read the shortlisted plays for Writersroom 10. New writing is under attack via cuts handed down from local government forcing theatres to adopt an increasingly risk averse approach to programming. Writersroom 10 offers an innovative solution to this, and the winning plays are some of the finest new plays I have read. Lucy Kirkwood: "It has been a great pleasure and an inspiring experience to read the short listed scripts, and to be introduced to writers thinking in such bold, fine, surprising ways. I am excited to think of the stories they will tell in the future." The winning writers will be updating us on their progress throughout the scheme on the writersroom blog. You can read the full press release on the BBC Media Centre website.